Garlic belongs to the family of vegetables called Allium, which also includes onions, scallions, leeks and chives. According to AICR's second expert report and its updates (CUP), garlic probably protects against colorectal cancer. 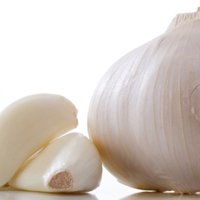 The protective effect of garlic was shown to have a dose response relationship. In other words, highest exposure to the food showed the greatest decrease in risk. For cancer protection, AICR experts suggest including garlic as part of a well-balanced predominantly plant-based diet. These allium vegetables contain many substances now being studied for their anti-cancer effects, such as quercetin, allixin and a large group of organosulfur compounds that includes allicin, alliin and allyl sulfides. In laboratory studies, components of garlic have shown the ability to slow or stop the growth of tumors in prostate, bladder, colon and stomach tissue. Laboratory research has also shown that one garlic component, called diallyl disulfide, exerts potent preventive effects against cancers of the skin, colon and lung. Recently, this compound proved able to kill leukemia cells in the laboratory. A compound derived from garlic called ajoene has displayed similar activity. In animal studies, components in Allium vegetables have slowed the development of cancer in several stages and at various body sites: stomach, breast, esophagus, colon and lung. AICR has funded research on the following topics relating to garlic and the cancer-fighting components it contains. Click each topic to search for relevant AICR-funded research studies performed to date. garlic more protective against cancer.